Metatask Slack app is finally here! Slack is a great communication tool used by hundreds of thousands of teams in the world to be more productive and more agilewith communications. And our team is no different, we are heavy Slack users ourselves! We worked hard to bring Slack support to Metatask. So now, when it is finally here — how to use it? How to add Slack integration? In Metatask you use Slack integration to send some (or all) of your notifications to Slack. You can add multiple Slack channels, from different workspaces and configure what should be sent to every channel. You can add new Slack channel on your profile settings page. Just open “Slack” tab and click on a “Add to Slack” button. Configuring which notifications to send to a Slack channel. Help article: How to connect your slack account. How to use Slack instead of email? When your team has a lot of tasks to work on, things can go messy in your email inbox. You will receive notifications about new available tasks, started processes, completed tasks… Let just say it the urge would be high to just go and disable all these notifications in Metatask settings. Fortunately, Slack is not email client and you can just route most notifications exclusively to Slack and keep only the most important in emails. 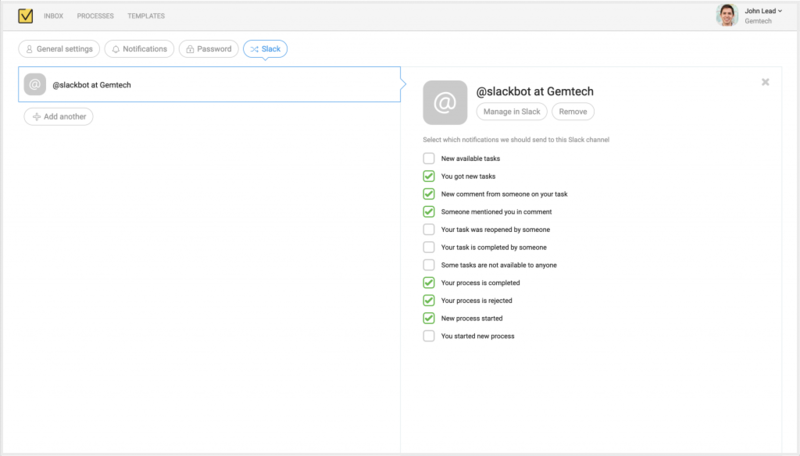 To receive messages from Metatask privately in Slack you can sent them to the “@Slackbot” channel. This way you will be receiving messages from Slack Bot as private communication in Slack. How to share updates with your team? You can post notifications to a public or a private channel, for example your department’s channel in Slack to keep everyone up to date about new and completed processes, assigned tasks, rejected and approved requests etc. Support filtering notifications in any channel by a template, eg. only send notifications related to “New client on-boarding” processes to #Sales channel and only send notifications for “Vacation request” to #HR channel. Support unfurling of Metatask links inside Slack. When anyone will post a link to Metatask task or a process — Slack will show a nice looking preview right in a channel. Support replying to comments right from Slack.